The first disc of this two disc set features the music from the original album. It opens with some typical Dio flourishes on “Discovery” and “Magica Theme,” the first being an alien voice discussing discoveries on the planet of Blessing, the second being a sweeping, soundtrack-like instrumental piece. With third track, “Lord of the Last Day,” though, we finally hit classic Dio territory with a plodding, heavy guitar riff from Craig Goldy and then, of course, Ronnie James Dio’s unmistakable, majestic vocals. Magica also serves as a high point, I think, for Goldy as Dio’s guitarist. Absent since 1987’s Dream Evil, his only previous studio recording with Dio, Goldy laid down some serious chops and riffs on this record, and I believe was part of the renewed energy. One of those riffs comes on the next track, “Fever Dreams,” which kicks the record up a notch and really, really starts to sound like the old Dio, setting a faster pace and moving away from the slower, more ominous sound that became Dio’s trademark in his later years. Those huge, energetic riffs keep coming at the listener rapid fire on “Turn to Stone” and “Feed My Head,” which is one of the touchstone moments on the record. Once again, the song very much puts me in mind of Dio’s earliest work, and that chorus hook, oh man, I’m not sure Dio ever wrote one that sticks with you more than that one. Of course, if you want to talk hooks on this album, you have to go to my personal favorite track, “Losing My Insanity.” It opens with a jaunty Irish-influenced acoustic piece for guitar and flute that slowly builds into a full-on, headbanging electric version of the same theme. Then you get the power part from Dio on the verse and chorus before we go back to that irresistible riff that makes you want to stomp, clap and bob your head over and over. After another ace solo by Goldy, the song fades back out to the original piece to end. To my ears, the song is a masterpiece that ranks right up there with anything that Dio ever wrote. The thing that I find most appealing about Magica, though, was the amount of variety. I hate to say it, but some of Dio’s later work, at times, seemed a bit one-dimensional. This record is anything but. “Eriel,” for example, gives us another movie soundtrack-type theme opening before we move on to one of those mid-paced signature Dio tunes. “Challis” (another personal favorite) is just a straight-up, old fashioned hard rocker with a nice lyrical mix of badass for the character and more poetic images. And there’s a rare Dio ballad, “As Long as It’s Not About Love.” You’d be hard-pressed to name more than a couple of Dio love songs, but when he decides to go there, he belts it out. It’s not my favorite song on the record, because, well, I’m not much of a ballad fan. But wow, even I’ve got to admit that his voice is incredible on the softer part at the beginning of this tune. The solo is another signature moment for Goldy, as well. To close the record, Dio reprises a couple of earlier tunes. “Magica Theme” returns in “Magica-Reprise,” this time with vocal accompaniment, and “Lord of the Last Day” makes another appearance to close things out with a dark, heavy punctuation mark. 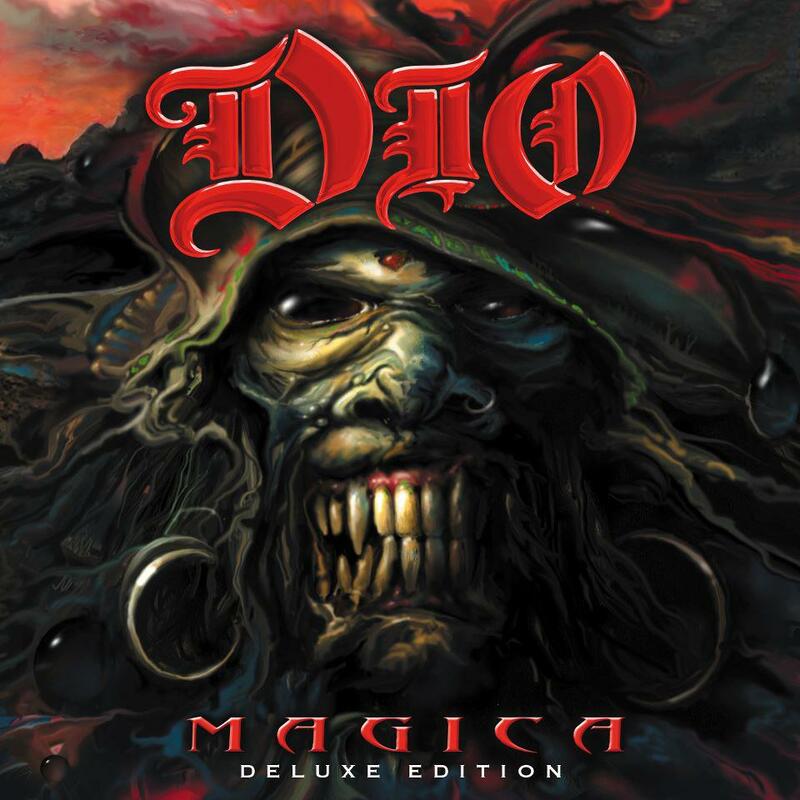 On the original album, the Magica story was told by Dio at the end. For this edition, it’s moved to the second disc, where even more treats await. First up after the story is “Annica,” a Japanese-only bonus track from the original release, followed by “Electra,” which was recorded for the sequels and previously released on a box set and The Very Beast of Dio Vol. 2. The instrumental “Annica” is another moody, sweeping piece that showcases Goldy’s talents. “Electra” blends that feel with something a little heavier and makes the listener a little sad that Dio never got to complete those two sequel albums. The remaining five tracks are pulled from an official live bootleg on the Magica Tour in 2000 – “Feed My Head,” “Fever Dreams,” “Lord of the Last Day,” “As Long as It’s Not About Love” and “Losing My Insanity.” These are pretty raw live recordings, not the polished-up, beefed-up, slick sounds we’re used to hearing on live albums. In that, they put a spotlight on just what an incredible vocalist Dio was. There are few, if any, flaws to be found in his performance. The best of the group might be “As Long as It’s Not About Love.” Goldy gives a slight blues-rock inflection to the guitar part, and Dio belts the song out with just as much power and feeling as he did in the studio. The Deluxe Edition gives Dio fans a fantastic package with all of the related Magica material — including bonus and unreleased tracks that you’d have to track down elsewhere — in one place. It’s a fitting tribute to an incredible record that, sadly, often gets overlooked when discussing Dio’s career. When fans talk about the greatest works of Dio’s career – Holy Diver, The Last in Line, Heaven and Hell – albums from his later years rarely get a mention. Magica, though, deserves to be in that discussion. In my collection, it’s every bit as essential as any of those other three records I mentioned. Here’s a chance to revisit it and see if you don’t agree.